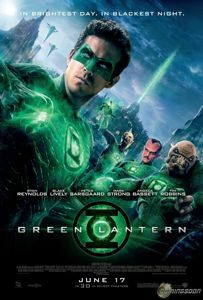 An alien spaceship crashes on earth and test pilot Hal Jordan (Ryan Reynolds) encounters the alien Abin Sur (Temuera Morrison), who gives him a ring which gives tremendous power to whomever wields it inducting Hal into the Green Lantern Corps. Meanwhile, on earth, scientist Hector Hammond (Peter Sarsgaard) has come into contact with the residue of the world-invading being Parallax, giving him telekinetic powers that he's using to get revenge on those who have wronged him. After being trained by Tomar-Re and Kilowog (voiced by Geoffrey Rush and Michael Clarke Duncan), Hal has to face both Hammond and Parallax. As a life-long comic book fanboy and a more recent Martin Campbell apologist, there was a strong chance my expectations and hope "Green Lantern" would do for DC Entertainment what Marvel Studios has done for Marvel Comics characters could very well have superseded my critical judgment. Unfortunately, the idea that Geoff Johns' "Secret Origins" would be used as a template are dashed fairly early in favor of a blueprint that comes from previous comic book hits "Iron Man" and "Spider-Man." While the general story structure is the same, the movie fails to avoid some of the biggest pitfalls that comes with comic book movies, because often what works great when being read doesn't work when you have the same words recited by actors. And really, there is no caliber of actor that could make the big cheesy speeches that permeate this movie work. While on paper, Ryan Reynolds should make a decent Hal Jordan, his limited range as an actor is painfully obvious as he's essentially playing the same character he's played in every other movie only this time wearing CG spandex. He gives it a fine college effort to bring his usual charms to the character, but he's no Robert Downey Jr. and the dialogue he's given does little to make Hal likeable. Even worse is Blake Lively, grossly miscast as Carol Ferris, making her come across like a Valley Girl than the tough woman who will one day run Ferris Aircraft. The romance scenes between the two of them that's constantly shoved down our throats is probably the worst part of the movie, partially because they're so mismatched. Otherwise, the CG world creation is generally solid even if it's hard to imagine those unfamiliar with the comics will be able to accept the world of Oa and the Guardians the way they are introduced. The computer-generated Corps members Tomar-Re and Kilowog look decent enough, but not even the voice of Geoffrey Rush reading the opening narration will make it sound any less silly to adults, whether they read comics or not. It's that bad dialogue and narration that often keeps the movie from delivering. For all the cool visual set pieces and cool CG constructs created by Green Lantern, and a few clever inventions for the movie like having Abin Sur's ring pull Hal to the crash site, there's some long-winded speech about how humans are worthy of the Guardians' attention that immediately sends it crashing back down to earth. And then back on earth, you have a choice between a stale romance or a weak villain. Who knows what could have been done to improve "Green Lantern"? The outer space stuff doesn't work because it just comes across as silly and over-the-top, while the earth stuff doesn't work because it's boring and derivative of far better comic book romances. Needless to say, when a movie bounces between being boring and being cheesy, that's not a good combination. Sure, there probably have been worse introductions to superheroes on screen–Ang Lee's "Hulk" is one and the first Tim Story "Fantastic Four" is another–but Campbell is a better filmmaker than the latter and working from far better source material than the former, so one wonders how this could have faltered so badly. Campbell also had such a great team including Oscar-winning cinematographer Dion Bebee, who helps the movie look great even with the converted 3D. While DC Comics are constantly proving themselves ahead of the curve in the comic publishing business, "Green Lantern" shows they have a long way to go to catch up with Marvel in terms of bringing their characters to the screen in a way that can please both fan and novice alike. There's little about "Green Lantern" that will convince non-comic readers to care enough about the characters to want to see more of them even with an obvious after-credits scene that just adds insult to injury, not just because it should have been dealt with in the body of the movie but also because by then, we just don't care to see what happens next. There's sure to be someone out there in the cosmos who enjoys this take on Green Lantern–small children and those without overly-critical tastes in entertainment–but it just fails on so many levels, both as a movie and as a comics adaptation, that it's easily one of the bigger disappointments of the summer.